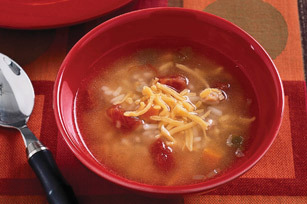 Give a can of chicken rice soup an upgrade with this Southwest Chicken and Rice Soup. This Southwest Chicken and Rice Soup is ready in just 10 minutes. Heat soup as directed on label with water. Stir in salsa. Top each serving with 2 Tbsp. cheese. Salsa and Cheddar cheese turn a canned soup into a south of the border burst of flavor. VISUAL- Show this with a cheese quesadilla. Top each serving with 1 to 2 Tbsp. chopped green pepper or corn. Makes 3 servings, about 1 cup each.